A getaway on the edge of it all. 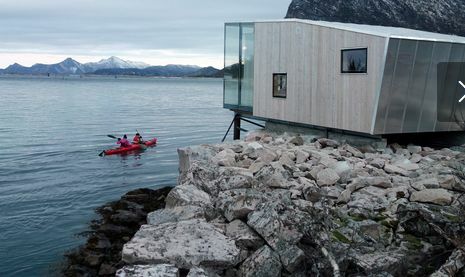 Manshausen is a unique hotel comprised of collection of buildings on an island off the coast of Northern Norway. Set on 55 acres, there are 4 seacabins that have dramatic floor-to-ceiling windows that extend over the water, while the main house accommodates the kitchen, dining area, and library. Activities at this year-round resort include alpine skiing, rock climbing, kayaking, diving, cycling, fishing, and hiking. An outdoor adventure-lover’s dream location!